OAG East Med Offshore Rentals is recognised as one of the fastest growing rental companies of offshore cargo carrying units (CCUs) in the Mediterranean region. With an ever-expanding fleet, OAG East Med is capable of delivering high-quality offshore container units with exceptional service. All OAG East Med equipment is built in accordance with DNV2.7-1 and EN12079-1 standards. It comes complete with full material trace reports, load test and NDT certificates as required. In 2013 OAG East Med has supplied products to a number of high profile customers, notably in the eastern Mediterranean region. These included orders to companies such as Halliburton (vacuum cutting skips) and Noble Energy International (all CCUs for its Cyprus deep water project). In 2014 we have projects planned with ENI and Noble Energy, in addition to a number of leading service companies. At OAG East Med we offer a wide range of products to meet the needs of customers and offer a container solution for almost any scenario. We rent dry goods containers in several different sizes. 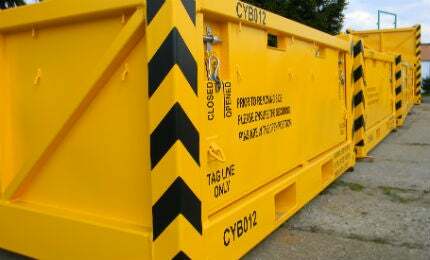 Each of our offshore dry goods containers is extra heavy-duty, and designed to withstand the harshest environment in offshore operations. Companies have used our models of dry goods containers for conversion into offshore workshops. OAG mini offshore containers are designed with multiple internal tie-down points for safe and secure transportation of cargo. These units also include a 2t shelf and safety net as standard. OAG East Med offers several types of half-height cargo carrying units (CCUs) , which range in size from the smallest (10ft x 8ft x 4ft) to the medium-sized half-height container with rear door (20ft x 8ft x 4ft) to the heaviest, which comes with removable side doors (20ft x 8ft x 4ft, gross weight of 20,000kg). Standard features include multiple internal tie-down points for safe and secure transportation of cargo, net securing points on all units and drainage points. OAG East Med can also supply larger open-top offshore containers. Customers can choose between a container that can handle 10,000kg in terms of gross weight (10ft x 8ft x 8ft, 6in) or another which is essentially double the capacity and can handle 20,000kg (20ft x 8ft x 8ft, 6in). Open tops come with standard heavy duty tarpaulin, multiple internal tie-down points and door lashing hooks. Aside from containers, we also offer cargo baskets for your transportation needs. These come in different configurations, such as the OAG standard 6.1m, 10.1m and 13.9m baskets. We also custom-build cargo baskets of different sizes according to customer requirements. Legislation and oil company policy in certain parts of the world has driven the industry to improve the management of drilling waste. Moving such waste around a rig site or from a rig to a treatment and/or disposal site without spillage is now essential. OAG drill cuttings skips easily meet these criteria by safely containing drill waste, enabling transportation without fear of spillage. The OAG drill cuttings skips have been designed to contain drill cuttings from all types of transfer equipment, which also includes vacuum sealing capabilities. Tiger Offshore Rentals of Texas, US, has announced that it has acquired OAG Offshore Rentals East Med, making it the only local provider of DNV 2.7-1 certified offshore equipment in Cyprus.